The story behind a graphic on insurance that turned into an unlikely viral hit. Last year, an interactive graphic about insurance turned out to be one of ProPublica’s most popular pieces of the year. I’m going to tell you about some things we learned in the process of designing and building it, from its bovine origin story to the challenges of visualizing an eyeball. The graphic came out of an investigation into workers’ compensation, led by my colleague Michael Grabell and Howard Berkes of NPR. In the United States, workers receive payments from their employers (or employers’ insurance carrier) if they are injured on the job. But over the last 25 years, the system has been slowly undermined, as chronicled in a series of powerful and heartbreaking stories. A bizarre aspect to this generally horrible situation is that if you’re a worker who suffers a serious injury, the difference between relative comfort and total disaster depends a great deal on where you live. 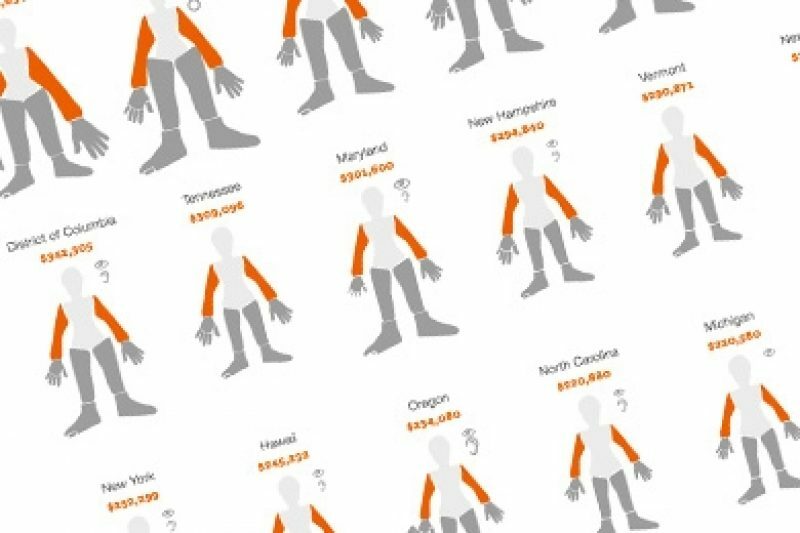 Losing your arm, for example, could mean a $50,000 payment in one state, and $500,000 in another. There are no federal standards for how much money you receive for lost limbs or other injuries. We wanted to visualize the vast discrepancies between different states’ reimbursement rates. Michael Grabell and researcher Cynthia Cotts had painstakingly researched each state’s system for doling out workers’ comp benefits. Many states put out a “schedule of benefits,” which is essentially a list of body parts and how many weeks of benefits a worker should be reimbursed for the loss of each: an arm, a leg, a hand, a thumb. New Jersey’s schedule of benefits, which lists worker’s compensation benefits for each body part. Some of these state laws have provisions that are hopelessly and embarrassingly out of date – Connecticut’s law, for example, still has a provision for “incurable imbecility,” a term that may have been acceptable in the early 1900s, but is now both unclear and just plain offensive. 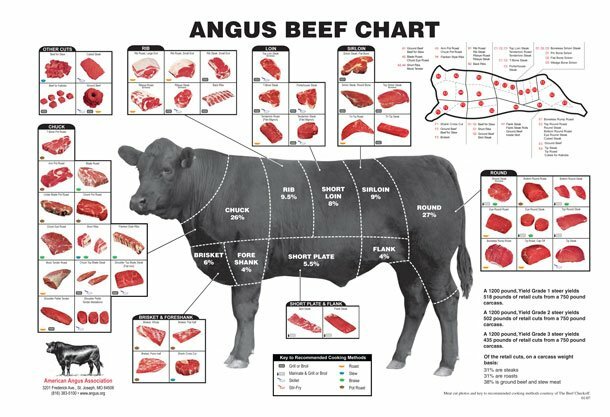 During the collection of all of the schedules of benefits, a source mentioned that these body part lists reminded them of the famous “Angus Beef Chart” you might see at a butcher shop. We thought … aha! What if we turned our data into a literal human beef chart? 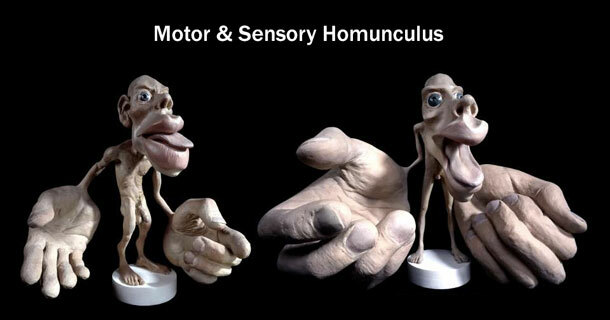 Let’s take advantage of a dataset on body parts and make a visualization of body parts. So, armed with Angus beef charts and the homunculus, we decided to go forth with this crazy idea. What could go wrong? But now, the technical challenge. We needed a way to programmatically size each of 17 different body parts, for each of 50 states, based on how much bigger or smaller they were compared to the national average. I began to look around for examples of other projects that involved resizing weird but recognizable shapes. It turns out that the cartogram does exactly this. A cartogram is a map form in which precise geographic shape and size is replaced by some other data (for example, resizing all the states in the U.S. based on their population). So in the same way that a cartogram distorts geography, we could distort limbs based on dollar figures. I came across an already existing cartogram that resizes each state but keeps it anchored to its center, built by Mike Bostock, creator of the popular charting library D3.js. Surely this strategy would work if I just swapped out states with limbs. But I also needed to be able to adjust the little feet and arms and hands after the transformations were complete. I used another Bostock example, a force-directed network of states, and applied it to a human shape. For my early experiments I used a cartoonish person. … things got nightmarish and horror-film-worthy very quickly. So, rather than stick with a realistic human body, I went back to the cartoon. I fiddled with multiple versions of this little figure, each time making it slightly more realistic. I would NOT use a human figure at all. No matter how much you tweak it, it’ll always look creepy as hell (sorry to be so blunt…) It sent shivers down my spine, actually. Cairo brought up some very valid points – but eventually my colleagues and I decided to keep going with our body parts approach, at our own peril. We reasoned that the figure was creepy, but then again, so was the subject. Losing a limb in a serious accident is devastating to real people, especially with our current laws. That was the story that Grabell and Berkes were writing. If our images elicited a slight bit of discomfort in those who saw them, it seemed fitting. This was a far more honest representation of the data than a dehumanizing bar chart. And even if it wasn’t easy for readers to accurately perceive fine differences, we decided that these figures did a great job of conveying the main point: States pay out vastly different benefits for the same injuries. We didn’t need to show the exact dollar amount difference between New Jersey and New Hampshire down to the last decimal point – for that, a bar chart would have probably been the better choice. But we wanted to show the simple absurdity that your limbs are valued differently depending on where you live. We tried very hard to make the figure as gender neutral as possible, because while people might have recognized a man in a hard hat, women get injured on the job, too. It was important for us not to ignore that. But then we ran into another wrinkle. Beyond hands, feet, thumb, etc., we also had data for EYES. Eyes, it turns out … are terrifying. It didn’t get better when I added the rest of the body. Or made the eyes outlined. Or especially put a bunch of them together. So, we went back to the original, and decided to include eyes as symbols. This was a fortuitous choice, because at the last minute we also decided to add in data on testicles, and thus avoided a whole other conundrum. To show how states compared to each other, we used a chart form called “small multiples,” which repeats small visual forms so that you can quickly compare them. We thought showing a repetitive grid of oddly shaped human figures would let people make quick comparisons across all states. But to show how a specific state compared to the national average, we let you click to see a zoomed in version, a side-by-side comparison of the national average figure with the state figure. We also here included detailed dollar amounts for each limb. Finally, we also made an animated gif to share on social media. Another absurd story: A few weeks after the project was over, I ran into this poster in a nautical-themed bar. Once again, inspiration is everywhere.